Jammu, Feb 9: The Jammu-Srinagar highway remained closed on Saturday for the fourth consecutive day due to snow accumulation and landslide debris on the strategic 300 km-long road, a traffic official said. "We are expecting to get the highway cleared by this afternoon. A decision to allow traffic will be taken after getting approval from the Border Roads Organisation and the NHAI (National Highway Authority of India)." 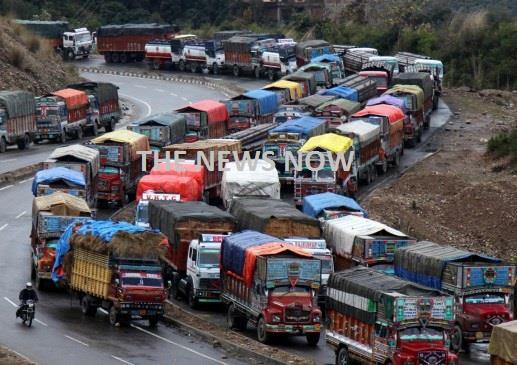 Over 2,500 trucks carrying essential supplies to the landlocked Kashmir Valley are stranded on the highway for the last four days. Meanwhile, airfare between Srinagar-Jammu and Srinagar-Delhi has skyrocketed ever since the closure of the highway. Flights to Srinagar airport resumed on Friday afternoon following a two-day suspension. A special Indian Air Force plane carried 179 students to Jammu from Srinagar on Friday. These students will appear for the Graduate Aptitude Test in Engineering exam on Saturday. The MET Office has forecast dry weather till February 13 in Jammu and Kashmir.